Peterborough United sneak onto television on reputation rather than form these days. Clearly those who select the live games for Sky haven’t realised that Posh are rarely involved in high-scoring games. They rarely even threaten to entertain. Posh right-back Michael Smith during his first appearance of the season at Southend. Photo: Joe Dent/theposh.com. Posh also don’t win on television. It’s six small-screen matches in a row now without a victory. But Posh chairman Darragh MacAnthony has more pressing matters than his team’s national reputation. He needs to restore local pride in his football club because performances like this one won’t keep hold of current fans, never mind attract any new ones. Manager Dave Robertson is the man under most scrutiny. He deserves to be, but he shouldn’t be facing the music alone. Any manager taking over at Posh for this season would have been handicapped from the start by the club’s habit of selling good players and replacing them with weaker ones. Even average Posh performers like Joe Newell and Jack Payne appear to be better than those who have been left behind. There are also many who should be coping with League One rather better. Michael Bostwick for one. He was immense following the departure of Darren Ferguson last season, but this term he’s played poorly and managed to collect five cautions and a suspension before the end of the first week of September. That’s horribly ill-disciplined for a man who started the season as skipper. Posh substitute Jack Collison is dejected as Southend players celebrate their second goal. Photo: Joe Dent/theposh.com. It’s a dilemma for sure and while Robertson insists he isn’t panicking, the same can’t be said for the Posh support, There are 40 matches to go and yet the manager’s reception, when he walked across to salute the 450 travelling fans at the end of this game, wasn’t entirely cordial. Southend failing to win any of their previous six competitive games this season might have had something to do with that. The home side might have won this game by five or six, but for Posh ‘keeper Ben Alnwick’s reflexes. He used his feet more successfully than most of the outfield players which meant Marcus Maddison’s 90th-minute close-range strike led to a rather more nerve-wracking finale than Southend deserved. Maddison even had time to curl wide from 20 yards after his consolation goal, to the annoyance of substitute striker Kyle Vassell who felt he should have received a pass. He was better placed, but on current form Maddison is more likely to score from distance than a Posh striker is to score from any range at all. The spat, played out in front of the Posh support, was unseemly though and will only have strengthened a view that all is not well in the camp. 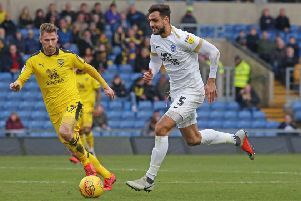 Posh defended woefully against a lively front two of David Mooney and Noel Hunt, but the back four could improve when Gaby Zakuani and Jack Baldwin return. Posh have been awful up front for most of the season and unless Lee Angol is Lionel Messi in waiting (the fact he can’t get into this side suggests that’s unlikely) it’s hard to see improvement in the near future, especially as they are being served by a midfield who will lack vision and creativity until Jack Collison’s knee recovers, or assistant manager Grant McCann can be cloned. Joe ‘The Goal’ Gormley might just own the most misleading nickname in football, It’s early in his Football League career, but Gormley has struggled to adapt to the rise in standard from Irish football. His was a surprise recall today to partner Conor Washington, a player who has shrunk under the pressure of leading this attack. Posh enjoyed pockets of pressure in this game, most notably the 20 minutes after half-time when Washington was replaced by Collison and Maddison was pushed further forward and into a more central role. During this period Bostwick’s 20-yarder deflected off Southend defender Adam Barrett and crashed into the crossbar and Collison saw his curling effort headed off the line following a fine run into the area by Chris Forrester, a slightly built midfielder who looks cool enough under pressure not to be written off just yet. Posh might well have won this game if the strikers on view had swapped sides. The movement of Hunt and Mooney ensured Ricardo Santos and Alex Davey endured an uncomfortable afternoon. On 10, 59 & 65 minutes Hunt was thwarted by the legs of Alnwick, while Mooney sent three glaring headed opportunities wide of goal. Hunt did finally strike on 70 minutes when heading in a free kick from 12 yards. It was an accurate strike, but made easier by a complete lack of marking and the goal deflated Posh who were flattered when Maddison found space in the six yard box to fire home a late consolation. Adam Barrett had poked the home side in front just after the half hour after Posh had been opened up down the right flank of their defence despite the presence for the first time this season of Michael Smith. Alnwick kept Hunt’s shot out initially, but Barrett, an ageing centre-back, reacted quicker than any Posh defender. Within minutes a similar move led to Michael Timlin testing Alnwick before Ryan Leonard volleyed over the crossbar when well placed. Posh had their moments before the break, usually from wide positions with Jon Taylor striking a shot into the side-netting after a strong run into the penalty area and Maddison losing control at the crucial moment after Gormley’s headed flick sent him racing in on goal. These really are worrying times for Posh, especially as results have actually been better than the performances. The one Posh League One win this season at home to Colchester could easily have gone the other way. The gradual decline ever since relegation from the Championship at Crystal Palace was confirmed in May, 2013 shows no sign of stopping. This manager got his best results - five wins his first six matches - when he adopted primitive defensive tactics and prompted passion and a strong work ethic from the rest. The lack of quality in the squad might force him to go that way again. He certainly needs to find some improvement and points pretty quickly, particularly if Posh want another healthy TV appearance fee. Posh: Ben Alnwick, Michael Smith, Callum Elder, Ricardo Almeida Santos, Alex Davey (sub Kyle Vassell, 82 mins), Michael Bostwick, Chris Forrester, Jon Taylor, Marcus Maddison, Joe Gormley (sub Souleymane Coulibaly, 65 mins), Conor Washington (sub Jack Collison, 46 mins). Unused substitutes: Dion-Henry Curtis, Shaun Brisley, Harry Anderson, Harry Beautyman. Southend: Dan Bentley, Jon White, Glen Rea, Adam Barrett, Ben Coker, David Worrall (sub Stephen McLaughlin, 86 mins), Ryan Leonard, Michael Timlin, Anthony Wordsworth, David Mooney (sub Luke O’Neill, 90 mins), Noel Hunt (sub Joe Piggott, 85 mins). Unused substitutes: Paul Smith, Luke Prosser, Jack Payne, Gary Deegan. Goals; Posh - Maddison (90 mins). Southend - Barrett (31 mins), Hunt (70 mins). Cautions: Posh - Bostwick (foul).